alright Jim. Now that's some real time info! Have a great trip and give us some updates. I made a "small" video thing I would love to share with everyone, but do not know how to do it. It is a windows media file and is normally about 30megs. I have reduced it down to less than 8. I would love to put it somewhere or email it to someone to get it on this site. 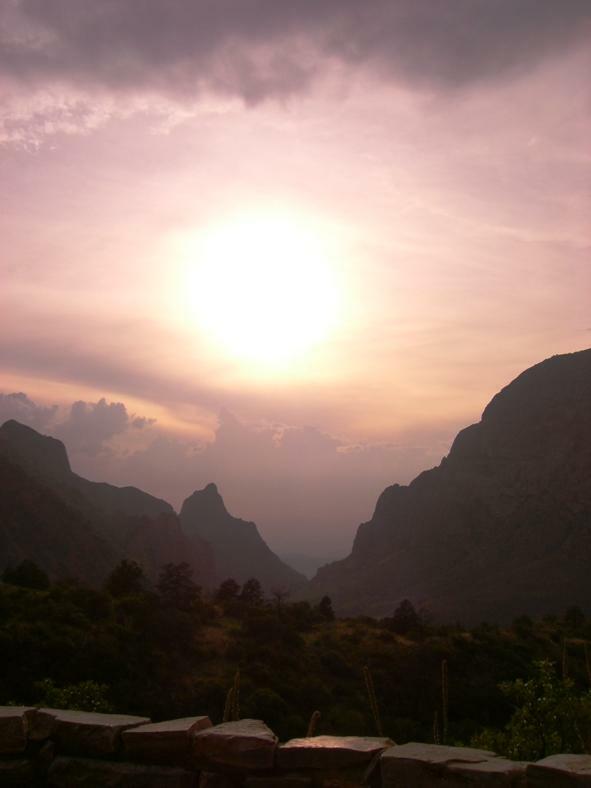 It is my own tribute to Big Bend. I will admit I look at it alot whenever I am stuck at work wishing I was there. Try uploading it to http://video.tinypic.com/ or http://www.putfile.com/ then post a link to it here. Also, I have no idea how to insert a photo. The one that David did is one of the best I have seen of the park. I know he has hundreds more. See http://www.bigbendchat.com/portal/forum/index.php?topic=309.0 for the basics. 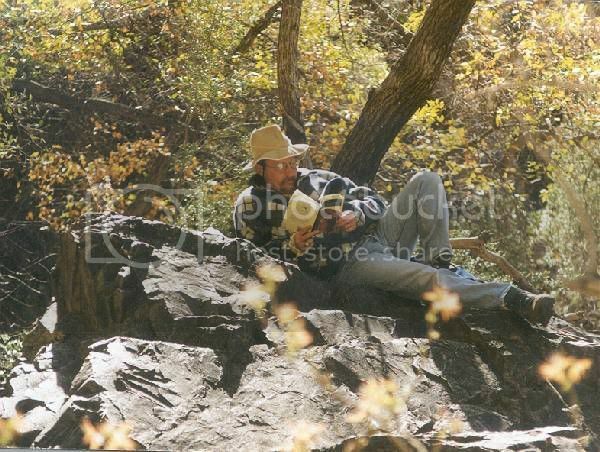 Here I am reading St. Augustine's Confessions on that great boulder in Cattail. That is one of my favorite places. I've seen Hinkley's Columbines blooming there and that bigtooth maple brilliant yellow. This picture says it for me. It doesn't have the expansive majesty of the South rim, but it's subtlety immediately relaxes. I wonder if this link gets to the windows media file.... I don't know how long it will take to download... the pictures are small. It Sure As Hell Did! It sure as hell did work. With "work" like that, don't know why you'd want to remain Anonymous :! : AWESOME picture! Hi Guest!....Or are you a member who didn't log in? That pic took my breath away! Pretty cool video so far. I hadn't tried tinypic.com for uploading video before. Putfile.com does something similar, where direct linking to the video files is prohibited. Once upon a time I had uploaded a video file to myFileStash.com which allowed a direct link, but then my account suddenly disappeared and I had to re-register. It also now has a 2MB file limitation and the MPG file I wanted to upload is around 6MB. To get an idea what Putfile is like, check out this video. That's what my Sony Cybershot generates as video. For those who are curious, that's me skiing Spencer's at Taos on my last day of skiing. Hope you have that sunset pic framed somewhere because it deserves a frame. I was the "anonymous".... sorry. I was using anther computer and forgot to login... I think this one does it automatically. I did get the window sunset picture to come up but am struggling with the video thing. I will be in BB 3/23 thru 3/26..... anyone else going to be there at that time? I'm in the park now, and just so you know, it has been a very dry year so far. There are very few blooms at this time (a few bluebonnets along the roadside), but nothing like some of the spring blooms in previous years. Not to put a damper on things, but just to pass along a bit of real-time info. We hiked to JF1 on Sunday, and the trees are still green, of course. So it was a pleasant hike with great views. And the night skies are as fabulous as ever. Thanks for the info, Jim. Sure hope it rains soooon!! !